Refer zigbee tutorial for more. Both mesh as well as star link types are supported between them based on device types. Zigbee products use very low power and are available at very low cost. They are based on LR-WPAN (low rate wireless personal area network) standard i.e. IEEE 802.15.4. Zigbee products will have protocol layers (PHY,MAC,network,security,application). Network,security and application layers are defined by zigbee alliance. Zigbee operates at various frequency bands viz. 868MHz,915MHz and 2.4 GHz. Out of these 2.4 GHz based zigbee products are very popular around the world. Based on antenna, transmitter output power and frequency it will cover about 10 to 100 meters. Zigbee supports mesh topology. Zigbee products delivers about 250Kbps of data rate. 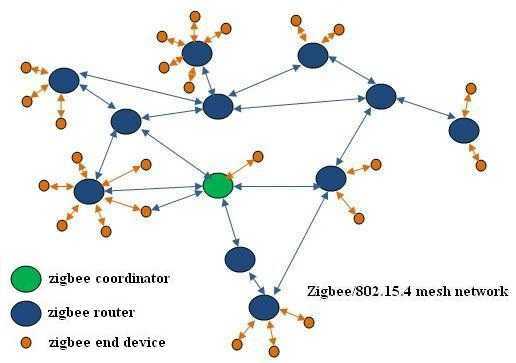 About 65000 devices are supported in a zigbee network. Zigbee in Healthcare - For example to monitor blood pressure, to monitor blood glucose level, bed sensor controller, weighing scale etc. Zigbee in smart energy - For example safe plug, smart socket,electricity consumption display, thermostats,energy manager etc. Zigbee in Home and building automation - For example remote control of various home and building related stuff. Zigbee for Closures - For example smart lock, Door sensor, occupancy sensor, etc. Zigbee for Home appliances - For example air conditioner, TV, digital water meter etc. Zigbee for telecom services - For example router/gateway etc. Refer page on zigbee tutorial which describes zigbee network,zigbee stack,frame structure,Physical layers,MAC frames. This page explains what is zigbee technology and provides useful links.